The following are some of the top news stories from the Paynesville Press for the second six months of 2005 (July-December). The first half of 2005: The Year in Review, covering January to June, ran last week and can still be read at www.paynesvillearea.com. A final Mass, dinner, and celebration was held at St. Anthony Catholic Church in Regal before it closed, 72 years after its founding, due to population decline and a shortage of priests. Father Fred Fink, who had been serving the parish, retired, and parishioners made the decision to close when their diocese asked them to choose between closing the church or making it an oratory. Status as an oratory would have meant recognition as an official church and devotions such as rosaries, but would have required financial independence. The Culpepper & Merriweather Circus performed two shows in Paynesville in the circus' second trip to town in three years. St. Anthony Catholic Church in Regal closed its doors in July, 72 years after its founding. 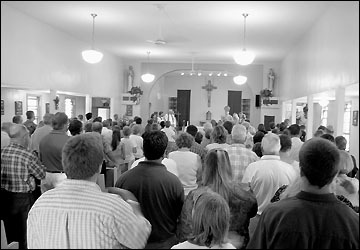 A packed congregation gathered for the final Mass at the church. The closing celebration also featured a dinner. Due to the shortage of priests, the closing of the church was planned, but it came about earlier than expected due to the retirement of Father Fred Fink. Unanimous support was given by the Paynesville City Council to the west alternative of the future route of Highway 23. In a letter to MnDOT, the council asserted that the west option had fewer problems and was a better compromise because it touched the city limits, did not split Paynesville, and was close enough for utility services to be provided to new developments at a reasonable cost. Paynesville grew when two parcels totaling 230 acres to the north of the city - south of 185th Street and on either side of Lake Avenue - were annexed. A preliminary plan for the development included 116 residential lots, 60 patio lots, seven to ten acres of commercial businesses, three acres for apartments, 18 townhomes, and 13 acres for industrial business. The Meeker County Board of Commissioners approved a smoking ban for "public places" and "places of work," with exemptions allowed for bars where no minors work in smoking areas and for restaurants and private clubs when closed to the public to accommodate private gatherings. Katie Nelson, the 2004 Miss Paynesville, received a hug during a homecoming at Paynesville Lutheran Church in July after she was crowned the 2005 Aquatennial Queen of the Lakes from a field of 47 candidates. There was a vacancy on the school board when Lowell Haagenson resigned after serving 18 months of a four-year term. Fern Roberg, who previously served two terms on the board (from 1994-2001), was appointed to fill the position until the end of the term in December 2007. The Economic Development Authority of Paynesville (EDAP), held a public hearing on a proposal to build 16 rental units for mid-income renters in Paynesville, through which it hoped to provide housing for entry-level professionals and for seniors. Local property owners shared concerns about having EDAP enter a private market and the project having too many units. Katie Nelson - Miss Paynesville 2004 - was crowned the 2005 Aquatennial Queen of the Lakes, the first Miss Paynesville to have that honor. She was chosen from a field of 47 candidates to represent Paynesville, Minneapolis, and the state of Minnesota in Japan, California, Florida, Texas, among other destinations, including many around the state. Thembekile (Thembi) Kuzwayo of South Africa was hosted by Marlys Pearson of Paynesville for nearly two weeks and spent time exploring the social services offered in Paynesville to gain ideas to implement in her country. A mission trip to South Africa in the spring had showed Pearson how apartheid still affects the country, and the problems that AIDS, poverty, and a lack of education pose there. The legislature passed a state budget in special session seven weeks after the year's regular legislative session ended. A partial state government shutdown, which had 9,000 state workers spending time off the job when their departments were not funded in time, was ended when the budget passed. Offices for the Paynesville Area Community Education program were opened in their new location in the middle school. Ground was broken at the new site of the Paynesville Area Community Service Center, located at the corner of Lake and Washburne Avenues. At the time, $100,000 had been pledged for the project, including large donations from the Lions International Foundation, the local Lions Club chapter, and the Paynesville Ministerial Association. 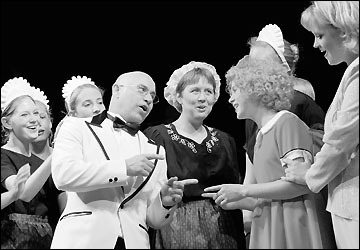 The musical "Annie" was performed five times by 36 local residents, with Rheanne Zimmerman as Annie and Mike Noonan as Daddy Warbucks. Total attendance was over 2,000 for the show, which was directed by Ian Pelton, who also acted and worked on sets with Molly Zimmerman. Charlene Strand was the musical director. Roscoe celebrated its 30th annual Fun Days festival. Ethnic foods served by 13 local groups, along with performances of ethnic music and dances by seven groups, highlighted the fifth annual Festival of Ethnic traditions. Over 2,000 people attended the community theater production of the musical "Annie" in August in the school auditorium. 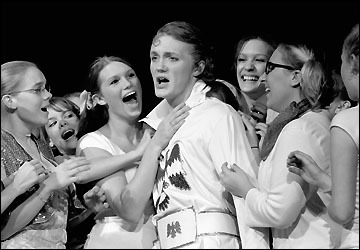 The musical starred Rheanne Zimmerman as Annie and Mike Noonan as Daddy Warbucks. It was directed by Ian Pelton, with Charlene Strand as musical director. A federal transportation bill included $7.1 million in funding for Highway 23 in Paynesville. Three farms in the area were recognized as century farms by the Minnesota State Fair and the Minnesota Farm Bureau: Scott and Kate Schaefers' land outside of Roscoe, the Fuechtmann farm (owned by Al Jr., Janet, Tom, and Kim) in Spring Hill Township, and Jim and Darlene Schoenberg's farm in the same township. Grace United Methodist Church held its 50th annual flower show. Dr. George Morris joined the Paynesville Area Health Care System (PAHCS) staff as a family practice/sports medicine doctor planning to split his time between the clinic in Paynesville and the Chain of Lakes Medical Clinic in Cold Spring when it opens. Dr. Morris had spent six weeks with PAHCS during his residency in 1997. Eighty-five comments received about the route of Highway 23 included 68 from individuals, ten from governmental agencies, two from Chamber of Commerces, and two petitions. Over 800 people attended the fly-in, drive-in breakfast held at the Paynesville airport, with 75 planes and two helicopters that flew in, and saw an air show and skydiving exhibit. The new secondary school principal, Lorie Floura, seven new teachers, and three new paraprofessionals began their first school year in the Paynesville district. Enrollment in the district declined for the 11th straight year, but the enrollment numbers, down 13 students from the previous year, made it the second year of minimal loss. Third grade teacher Ross Englestad began the school year with the group of third-graders that he taught as second-graders the year before, the first group of students in the optional looping classroom offered at the elementary school. Having the students familiar with the classroom and teacher cut back on the adjustment period before content could be focused on, parents and teachers agreed. The Paynesville Area School District was recognized as making Adequate Yearly Progress after failing that federal No Child Left Behind standard the previous year. Individual schools were also ranked, and both the elementary and high schools earned five stars, the top ranking, with the high school receiving five stars in both reading and math and the elementary school earning that in reading. The middle school received four stars in reading while both the elementary and middle schools got three stars in math. Dave and Janel Hemmesch, who graduated from PAHS in 1998 and 1999 respectively and later married, released their first CD. The self-titled debut, "Dave and Janel" included a song called "Koronis Hills" as well as other references to Paynesville. Stearns County, along with 17 others in Minnesota, was declared a federal agricultural disaster area because of the excessive rain, hail, and winds that had prevented planting from May to mid-July. Approximately 140 farms with 4,400 acres in Stearns County were affected. Low-interest loans were offered to affected farmers. Relatives from Biloxi, Mississippi evacuated to stay with Howard and June Simpson on Rice Lake. Bruce Simpson and his wife Vicki were here when Hurricane Katrina hit the Gulf Coast, and, when they decided to stay, they were joined by their son Matt, daughter-in-law Melissa, and three-year-old grandson. A review of fishing regulations on Long Lake ended with the Minnesota Department of Natural Resources believing that some special regulations should stay in place. Since 1997, anglers on Long Lake have been prohibited from keeping any largemouth bass 12 inches or larger so that larger fish could populate the lake. This same regulation will be in place for 2006, though other options were being considered. 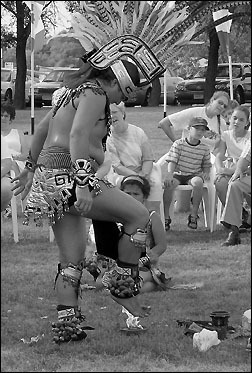 The fifth annual Festival of Ethnic Traditions was held in Paynesville in August, including this performance by an Aztec dancer. Catholic Charities broke ground for Paynesville's first foster care home for the physically disabled. The four-bedroom home in WilGlo Acres was to be the first of its kind built by the organization, and the project was planned in response to the needs of Dennis Olmscheid. A car accident had rendered Olmscheid a quadriplegic, and the organization planned for him to be one of the first to move into the home, which was built with the help of his family and was planned with an office for 24-hour staff. Jeff Siemon - a former Viking linebacker of 11 years who found his faith in college - visited Paynesville Lutheran Church to speak on how to be a man of faith and servant leader. After four years of study, the Minnesota Department of Transportation announced the west alternative as the "preferred alternative" for the future route of Highway 23. Comments and concerns about the west route only were to be considered after the announcement, while the project sought a record of decision from the federal government and right-of-way acquisition to get the property needed for the new four-lane highway. As its 2005 fiscal year ended, PAHCS projected a $1 million profit for the 2006 fiscal year. A $1 million profit had been projected for 2005, also, and PAHCS still expected a profit of $0.775 million for that fiscal year despite having paid $0.423 million back to Medicare because it had been overcompensated. In addition to the $1 million profit, the hospital district expected to add $1 million to its reserves and to spend $1 million for capital improvements during 2006. A four-plex rental townhome project, to be built and managed by F & L Management and Development under an agreement with the city and the Economic Development Authority of Paynesville (EDAP), was approved by the city council. The council agreed to cover the costs of project, to be located in the WilGlo Acres Addition, if rent was insufficient. Originally a 16-unit project, the plan was scaled back by EDAP in response to concerns from property owners about flooding the rental market and government competition in a private market. The four-plex plan included a three-bedroom, two-car garage unit; a two-bedroom, two-car garage unit; and two two-bedroom, one-car garage units. Seniors Kayla Nelson and Jamie Paul were selected Homecoming queen and king for PAHS. A new orderly annexation agreement was reached between the city of Paynesville and Paynesville Township that identified 1,100 acres for possible annexation. These properties, which included almost 300 acres owned by the city as part of the lagoon system, were seen as having a possible need for city services, though annexation must be requested by more than half the property owners in a parcel. After being denied a grant from the Small Cities Development Program last spring (ranking 22nd of 50 applicants while the top 16 received funds), the Paynesville City Council approved putting in a request for $1.275 million. The money would be used to provide grants or low-interest loans for rehabilitation to 27 commercial buildings, 24 owner-occupied residences, and 13 rental properties. No eligibility guidelines would be put in place for businesses, which would likely take out repayable loans, while residential property owners would face income guidelines to receive grants. An open house and ribbon-cutting ceremony was held to celebrate the opening of the new Paynesville Area Community Service Center, located on the corner of Lake Avenue and Railroad Street. The Paynesville Lions Club fundraised for the $100,000, 3,400 sq. ft. building, which dozens of individuals, businesses, and organizations contributed to and 18 businesses helped construct directly. The center was founded by Ruth Aulick in 1965, who ran it out of her basement before it was moved to the attic of the old city hall, to an old home on River Street, and then to the new building. A tentative agreement on a two-year contract was made between the school district and its teachers' union which included a 3.75 percent increase during the 2005-06 school year and a 4.5 percent increase for 2006-07, slightly below the state average for districts who had already reached agreements. In the agreement, which still needed to be ratified by the union members and the school board, a new health insurance plan with a high deductible and lower premium was offered, along with other changes. 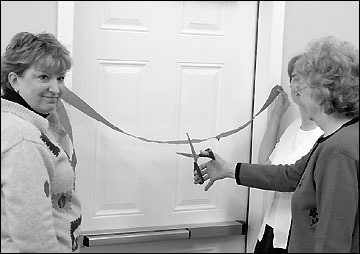 Founder Ruth Aulick cut the ribbon during the grand opening of the new Ruth Aulick Building for the Paynesville Area Community Service Center near downtown Paynesville in October. A proposed landfill for Roseville Township was denied by the Kandiyohi County Board of Commissioners. It was to be located on the site of a current gravel pit on Co. Rd. 2, a mile northwest of Hawick, but concerns about groundwater contamination, lack of a reclamation plan, and lack of support for the project by citizens were cited by the commissioners as they voted against it 4-1. The PAHS choirs presented the musical, "Bye Bye Birdie," with over 40 choir members participating. The story followed a rock star, Conrad Birdie (Bryce Fischbach), who is going to join the army, but his manager (Dugan Flanders) and his secretary (Caitlin Lien) devise a publicity stunt for the song "One Last Kiss" that takes them to a small town in Ohio. A certified addiction registered nurse visited the high school and middle school to speak about methamphetamine and also spoke to parents in an evening session, describing the problems and consequences of meth addiction. A new 28,500 sq. ft. Paynesville SuperValu opened its doors. The new store more than doubled its floor space from its downtown locale. A business group asked MnDOT for greater access, lower speeds, and stoplights to be included in the proposal for Highway 23 improvements in Paynesville. Stan Yarmon, the spokesman for a group of concerned businesses, received applause for his comments at a public informational meeting at Paynesville City Hall, but MnDOT representatives indicated no interest in lower speeds or greater access for Highway 23, saying MnDOT had compromised on the location of the chosen west route. Paynesville Area High School was honored for being one of only five high schools in the state to earn five-star ratings in both reading and math by being invited to a meeting with education commissioner Alice Seagren. The list of double five-star high schools included: Bloomington Jefferson, Eastview, Edina, the Math and Science Academy, Mounds View, Northfield, Orono, Rosemount, St. Anthony Village, Watertown-Mayer, and Woodbury. Paynesville was the only rural high school. Four uncontested candidates earned four-year seats on the Paynesville Area School Board, which had a low turnout due to the uncontested races. Newcomber David Johnson led the votegetters with 175 votes; incumbents Mark Dingmann and Allen Schmidt earned second terms with 170 votes; and incumbent Deb Glenz was elected a fourth time with 146 votes. Ermin Albrecht, a 52-year member, was named the first ever Legionnaire of the Year on Veteran's Day by the Paynesville American Legion for his volunteerism and dedication to the local post. Forty PAHS choir students staged the musical "Bye Bye Birdie" in November. Junior Bryce Fischbach starred as the rock musician Conrad Birdie who is joining the army and goes to a small town in Ohio as a publicity stunt for his farewell song, "One Last Kiss." An information meeting at the Paynesville Area Health Care System about the new Medicare Part D (prescription drug coverage) attracted over 100 local seniors. The sign-up period started on Tuesday, Nov. 15, with coverage starting on Jan. 1, 2006. The Koronis Manor received the 2005 Hospice Champion award from Heartland Home Health Care and Hospice for staff efforts to promote hospice at the nursing home. The Paynesville City Council passed a formal resolution asking MnDOT for an intersection or interchange on the proposed Highway 23 on the west end of Paynesville. The council passed the resolution two days after meeting with MnDOT representatives from the Willmar office (District 8), where they indicated having full access on this end of town was their top priority for changes to the MnDOT proposal. Another section of the Lake Koronis Recreational Trail was scheduled to be built in 2007 with committments of $80,000 each from the city of Paynesville, Paynesville Township, Meeker County, and Stearns County. This section would run along Baywater Road on the west end of Koronis and in the right of way of Co. Rd. 20 on the south shore of the lake. Two other sections - linking the city to the lake and linking the city to the Glacial Lakes State Trail - are scheduled to be built in 2006. The school district's annual audit revealed that the district ran in the black for the fourth straight year in 2004-05 (from July 2004 to June 2005). The district had $8.753 million in general fund revenues and $8.47 million in general fund expenditures to produce a positive operating balance of $283,000 for 2004-05. This raised the district's general fund balance to $845,00, the highest for the district since 1998-99. PAMS thespians staged a play version of C.S. Lewis's famous story, "The Lion, the Witch, and the Wardrobe," over the same weekend that the Disney movie opened at movie theaters around the country. MnDOT representatives presented a revised proposed layout for Highway 23 improvements in Paynesville along the chosen west alignment. At the request of the city, MnDOT added a full interchange on the west end of town, increasing the estimated cost of the project to $46.5 million.